Congratulations to these hard-working students on being awarded the 2016 GCPA Scholarship. Students are: John Bagwell – UGA Athens, David Daughtry – ABAC, Taylor Randell – ABAC, and Kelly Paulk – UGA Tifton. 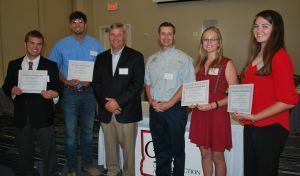 GCPA has established the Georgia Crop Production Alliance Scholarship to be awarded to undergraduate students enrolled in an agricultural-related discipline at an institution of higher education in the state of Georgia (including, but not limited to, Abraham Baldwin Agricultural College, Fort Valley State University, and The University of Georgia). Students must be pursuing a degree, or program of interest, directly related to issues that affect crop production. Register NOW for the 2018 Sporting Clay Fundraiser! Striving to improve the quality of life and the efficiency of crop production in Georgia.